Small batch | Food E.
I don’t have to tell you guys how much I love dessert, and it’s never too late in the evening or early in the morning to retreat to the kitchen to create something sweet. Last night around 8:30PM I was dying (DYING) for a dessert and M&Ms just weren’t cutting it. So I turned to the amazing blog Dessert for Two where the blogger develops recipes specifically for small batches. Want two cupcakes? 8 cookies? Lasagna for you and your significant other with no leftovers? This girl has a recipe for it. My dessert criteria were: something I could mix by hand, something I only had to dirty one bowl for, and something I had all the ingredients for in the fridge. BAM. Blondies. Only I don’t really like butterscotch chips and I didn’t have any anyway so I substituted regular chocolate chips. BEHOLD. The most delicious, insanely chewy, un-freakin-believably good cookie bars you have ever had. All I have to say is, it’s a good thing this only made 6 small bars because The BF and I ate. them. all. Maybe I even put the pan on the AC unit to speed up the cool down so we could eat them faster… I don’t know. Preheat oven to 350 degrees. Line a 9 x 3 x 5 loaf pan with parchment paper*. In a small bowl, mix together the brown sugar and melted butter with a wooden spoon. Add the egg yolk, vanilla, and salt and stir well to combine. Sprinkle the flour and baking powder over the brown sugar mixture and stir just until combined. Fold in chocolate chips. Pour batter into the loaf pan and spread until batter is about 3/4 of an inch thick. My batter did NOT cover the entire base of the pan which is fine because this doesn’t spread. Bake for around 20 – 25 minutes or until a toothpick in the center comes out with moist crumbs stuck to it. Remove parchment paper and bars from pan and let bars cool on a wire rack for at least ten minutes before cutting into 6 evenly sized bars. *Note: If you don’t have a loaf pan you can still make these. 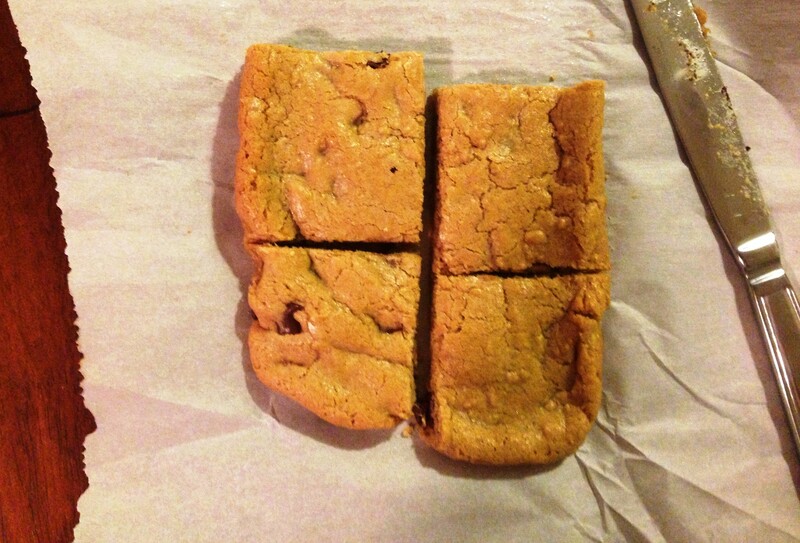 You can spread the batter out evenly on a cookie sheet since the batter doesn’t spread. And let’s face it… you aren’t making these to look pretty for company. You’re making them to stuff your face before bed.